The Central Industrial Security Force (CISF) will intimate to the candidates about the date, time and venue of the Physical Standards/Physical Efficiency Tests and Medical Standards Tests to be conducted by them. In case any candidate, whose roll number figures in this list, does not receive any intimation regarding the same, he/she may contact the CISF Authorities, immediately. The marks and other details related to examination shall be available on the Commission’s website within 30 days from the date of publication of the final result i.e. after conduct of the interview and would be available on the website for a period of 30days. Candidates are also advised to intimate the change in their address, if any, to the CISF authorities at HQ: - DG, CISF, Block No. 13, CGO Complex, Lodhi Road, New Delhi-110003. 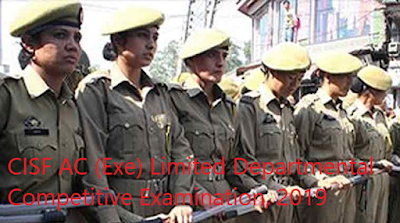 CISF AC (Exe) Limited Departmental Competitive Examination, 2019. 16th April, 2019 / 26 Chaitra, Saka 1941.